I have been fortunate enough to amass a nice collection of autographed baseball cards. Among those I prize the most are some of the cards you have seen already on this blog from Hall of Fame players like Nolan Ryan, Hank Aaron, Duke Snider, Tom Seaver and Carlton Fisk. But there is one autograph card that I haven’t shared with you that I prize just about as much as the cards I have mentioned. It is not in mint condition, there’s a good size chip at the bottom the card. Until today, it had little monetary value. The player on this card did not break any records, as a matter of fact his official MLB career stat line is 1 game played, 1 plate appearance, 0 at-bats with a 1.000 on-base percentage. Here is the card I am talking about. A 2004 Bowman’s Best First Year Autograph Card of Adam Greenberg. off. Adam Greenberg’s tale is an amazing journey of perseverance, filled with the elements of great story telling; triumph, tragedy and pathos. Growing up, Greenberg was a multi-sport athlete, excelling in Baseball, Basketball and Soccer in High School. He was named team captain in all three sports and graduated with honors. Greenberg turned down Harvard and Yale to enroll at the University of North Carolina at Chapel Hill, home of the Tar Heels, where he concentrated on Baseball. 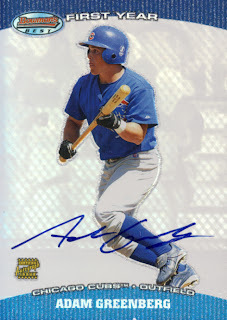 As a junior he had a phenomenal season that led to his selection by the Chicago Cubs in the 2002 MLB Draft. Greenberg left UNC that year to play Single-A ball in the Cubs’ minor league system and was quickly bumped up to Class A-Advanced. It took him two years to move to Double-A ball but only 32 games to move up to Triple-A. Throughout his initial minor league experience, Greenberg put up respectable numbers, but it was his hustle and work ethic that made most take note. At 5’ 9” and 170 pounds, there was no expectation of power, but he used his size to draw walks and his excellent bat control to find the holes in the field, all of which contributed to an impressive .384 on-base percentage. He frustrated defenses with his base running instincts, often stretching doubles into triples and stealing bases at key moments. His ability to blanket the outfield, willingness to sacrifice his body in the pursuit of fly balls and his strong, accurate arm made him a fan favorite. Scouts projected Greenberg to be a fourth outfielder in the Majors, a utility player with tremendous late-inning situational value and an occasional starter with great potential as a lead off hitter. He was described as the kind of player that everyone wants on their team, a rare find. So it was not surprising that Greenberg got the call to “The Show” on July 7, 2005, still at the age of 24. In a game featured on ESPN’s Sunday Night Baseball, the Cubs were in Florida to face the Marlins. Up 4 runs to 2 in the top of the 9th inning, manager Dusty Baker sent Greenberg into the game to pinch-hit for Cubs reliever Will Ohman. Greenberg made his way to the on-deck circle to the cheers of his parents and siblings who had traveled in from Connecticut earlier that day and were sitting in box seats directly behind home plate. On the mound for the Marlins was Varlerio de los Santos, a hard throwing left-hander. Greenberg stepped into the batter’s box and took his stance, ready to live out the dream of any kid who grew up playing baseball. On the first pitch, de los Santos unleashed a 92 MPH fastball that was up and in. With no time to react, Greenberg was hit by the pitch with tremendous force to the back of the head. Greenberg went down to the ground as his family watched from the stands. Thinking his head had cracked open, Greenberg immediately grabbed it with both hands to contain the damage. His head swelled, he couldn’t control his eyes as they rolled up into the back of his head and all he kept thinking was “just stay alive.” In an instant, a life changing moment of triumph had turned into one of tragedy. After a few minutes, Greenberg walked off the field supported by the team’s trainer. He was sent to the hospital where he was diagnosed with a concussion. Three weeks later Greenberg told the club he was ready to head back to the minors for rehab, but that was not the end of his troubles. He continued to suffer. Just bending over to tie his shoes caused migraine headaches that would last for hours. He had to sit upright to sleep. In the outfield, when charging a ball, his eyes would shift from side to side making it a challenge to handle routine plays. For months Greenberg dealt with these symptoms, consulting doctor after doctor, trying to get an accurate diagnosis of his condition. It took several months before he found a doctor who discovered that Greenberg was suffering from Positional Vertigo, a disorder of the inner ear that causes a spinning sensation with changes in the position of the head. By 2006, a year and a half later, Greenberg was symptom free, but there was still work to be done. His batting average in the Cubs minor league system dropped below .200 and the team released him. Most people at this point would start to accept what fate had handed them and move on. Greenberg is not like most people. He started seeing a strength and conditioning coach in addition to a sports psychologist. Over the next few years he bounced around in the minor leagues between the Los Angeles Dodgers, the Kansas City Royals, the Angels and finally the Cincinnati Reds, all the while bringing his game closer to where it was on that fateful Sunday in 2005. But in 2009 he was unable to make the Reds’ minor league roster, so Greenberg moved to the Atlantic Independent League, playing for the Bridgeport Bluefish near his hometown in Connecticut. He posted solid numbers, but with his 30th birthday on the horizon, it was becoming apparent his window of the opportunity to make it back to the Majors was starting to close. Greenberg began balancing his life with the pursuit of his dream. He got married to one of his grade-school classmates, Lindsey and started a business, a nutrition company. But Greenberg’s will to return to the Major Leagues never wavered. On April 29th, 2011, the opening day of Bridgeport’s season, fate provided Greenberg opportunity. As the game between the Bluefish and the Long Island Ducks extended into extra innings, the Ducks brought in relief pitcher Varlerio de los Santos, the former Marlins pitcher who threw the pitch that hit Greenberg in the head. In the bottom of the 11th inning, Greenberg came up to bat against de los Santos in a situation that Greenberg described as “a major league setting” for the two of them, a flashback to 2005. With a runner on first and Greenberg at bat representing the winning run, de los Santos’ threw his first pitch which started in on Greenberg, heading towards his head and then cut back over the plate. Greenberg took a moment to regroup. Three pitches later he hit a single to right field. Greenberg continued to pursue his dream of a return, but as the season came to a close, he admitted that if he never made it back to the major leagues, that rematch at-bat against de los Santos in the minors would be the biggest one of his career. Perhaps that was his second chance and his hit was all the vindication he needed. While that door shut, another one opened. With renewed interest and his Jewish heritage, Greenberg was invited be the special assistant to the manager of Team Israel, former MLB catcher Brad Ausmus, during the team’s bid to qualify for the 2013 World Baseball Classic. It wasn’t a playing position, but he was back in baseball. Then, just as he was about to head to Florida to join the team, fate provided Greenberg another opportunity. Former MLB outfielder Gabe Kapler removed himself from Team Israel’s roster due to an injury. Ausmus chose Greenberg to replace Kapler on the player roster. In an amazing twist of fate, Greenberg only had only one plate appearance and he was walked, giving him the same stat line as that of his MLB career, 0 at-bats with a 1.000 on base percentage. But this time Greenberg ran the bases after being walked and scored a run. Team Israel made it to the finals but lost to Spain, and that very well could have been the end of Greenberg’s story. But with less than ten games remaining in the MLB season, his story has taken another twist. Greenberg will get at least one more at-bat in the Majors and it will be the team that was responsible for ending his MLB career with one pitch, the Marlins. Greenberg will sign a one-day contract with Miami that guarantees him at least one at-bat during the Marlins’ October 2nd game against the New York Mets. Greenberg will donate his one-day salary to the Marlins’ foundation, which will then make a donation to the Sports Legacy Institute, a group that furthers the study of the effects of brain trauma in athletes and other at-risk groups. There have been comparisons drawn between Greenberg’s story and that of Moonlight Graham. To be fair, those comparisons miss the target. While he never got an at-bat, Graham played in right field for two innings and made the choice to leave the majors on his own terms, to pursue a career in medicine. There have been others who were hit by a pitch in their only at-bat, Charlie Faust, Cy Malis, John Rheinecker, Ham Wade and Harvey Grubb, but they all saw action in the field. Perhaps the closest comparison to be drawn to Greenberg would be Fred Van Dusen, the only other Major League baseball player to be hit by a pitch in his only at-bat who never got to take the field. But Van Dusen saw 4 pitches during that at-bat and was healthy enough to take first base before the next batter popped out to end the game. Even that story does not compare to Greenberg who never got beyond the first pitch. Come next Tuesday that all should change. It might be the definitive end to his Major League story or the beginning of a new chapter, or both. It is still possible that Greenberg will only see one more at-bat. That is all that the Marlins have promised. Something crazy could happen like being hit by a pitch or drawing a walk which would still leave Greenberg with the same MLB career stat line of 0 at-bats with a 1.000 on-base percentage. So many ways for things to go wrong, but so many ways for things to go right. But as Greenberg has said, "It doesn't matter if I get a hit or I don't, this has already been a success." One thing that is certain is that Greenberg now sees the bigger picture, that this journey has taken on more meaning than just his personal pursuit to fulfill his dream. Greenberg’s story now represents lost opportunity, perseverance in the face of adversity and hope of a second chance for all. “I am no different or more special than anyone else.” he recently said, "Keep going. If you do that, good things do happen. Sometimes it takes seven years. But you know what? Anything is possible. That just shows what is possible." That is why I hold his autograph card in such high esteem and why it will always remain a part of my permanent collection. Great post. I too collect cards to collect stories. I saw a Yahoo article on him yesterday and looked through my autograph binder to see if I had him... unfortunately I don't. I think it's pretty cool that so many people campaigned and supported him. Also Kudos to the Marlins for giving him another shot. One of these days, I hope to add at least a base card of his to my PC.